Peeling hard boiled eggs stresses me out. I’ve tried it the “spoon method” … where you break an end with a spoon, then slip the spoon under she shell and scoop it out. NOPE. I’ve tried the “rolling” method” … where you roll it all over on the counter, and then peel off the shell. NOPE. And I know I’ve tried other ways. 80% of the time, I end up taking off layer of the egg along with the shell. My peeled eggs are rarely smooth and pretty. 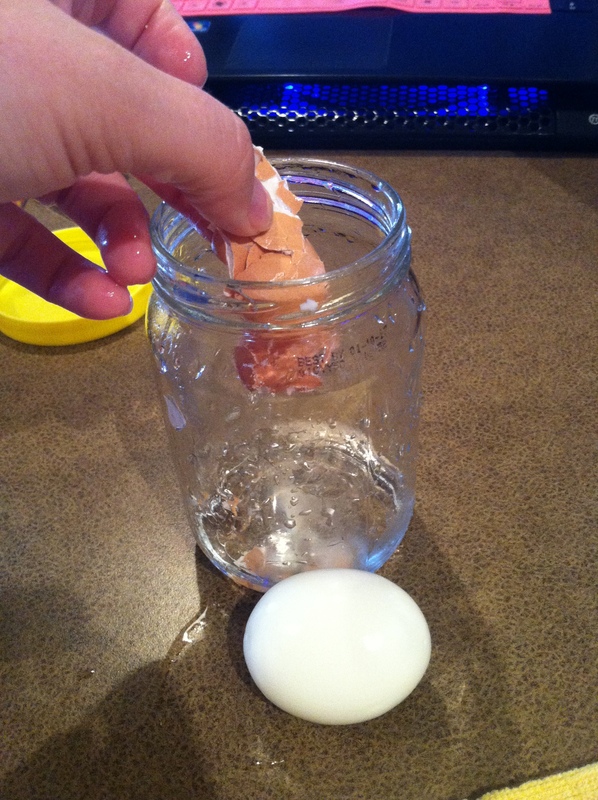 I was on Facebook and my friend Melissa shared a video of an easy way to peel an egg. So, after I watched it, I was amazed, yet skeptical. So I boiled an egg, and tried it! Looooooook at it! Look how beautiful it is!! So smooth! None of the white part came off with the shell! It’s so easy!! My poor friend Teo was on the phone with me and had to listen to my nonstop excitement…for the next while. 1. Get a glass cup or jar. Your hand has to fit over the opening, leaving a little bit of space for the water to escape. 2. Put the hard boiled egg inside. 3. Fill it up with water, about 3/4 full. 4. Put your hand over the top (or put a lid on, if it’s a jar), and shake it over the sink so the water can come out into the sink as it escapes (unless you have a lid on). My hand is smaller than the guy’s in the video…or my glass was bigger…either way, I ended up just grasping it around the top, not the bottom as well. 5. Shake for about 10 seconds, or more if the shell isn’t coming off easily. 6. Take out your magically peeled egg, and be AMAZED. Go and try, and tell me how it goes for you!